Grant proposal for RFP 2013-06: ORCID iD Adoption and Integration Program for integrating ORCID iDs using the ORCID API into the SobekCM Software which powers the UF Digital Collections, IR@UF, Digital Library of the Caribbean (dLOC) and many more digital repository systems, hosted by many institutions, and with thousands of scholar-contributor users. 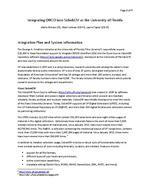 Grant draft evolving on August 9, 2013, with update on August 23, 2013, and full proposal will be loaded by August 31, 2013. Valrie Minson also listed on publications as Valrie Davis. Page 4 of 7 Use cases : ORCID creation for authors: A chemistry professor wants to contribute an open access article to the IR@UF and does not have an ORCID i D. The researcher understands the role of an identifier in demonstrating his research impact and logs into the IR@UF and the interface allows him to easily create an ORCID iD ORCID creation for co authors : An author submits a journal article to the IR@UF list ing four co authors. Based on the citation information, SobekCM with the ORCID API find s possible ORCID iD matches. IR@UF prompt s the author to verify the coauthors based on the matches found through ORCID iDs. Associate publications dat a sets presentations, poste r sessions, audio, video, and other scholarly and creative works : A n agricultural science researche r, when listed as a PI or lead author submits authored papers training videos, data sets, conference posters, reports, grant proposals, and other scholarly works to the IR@UF The researcher would like to locate all materials in the IR@UF where he/she was a collaborator and to display the collaborative and single author works together The researcher logs in and locates and connects a full list of materials with her ORCID identifier. Support institutional data efforts : A Data Curation Coordinator for a campus research center wants to include ORCID identifiers in a locally managed profiling system and is already using the SobekCM API for UF authored publication data. The coordinator update s the query for the SobekCM API to include available ORCID iDs. Leverage ORCID identifiers for supporting external data sources and disambiguation : An Analyst in the Office of Institutional Planning and Research is developing a new reporting methodology to enhance faculty publication tracking and reportin g on all authored publications already in the IR@UF as well as public ations held in other publisher database The Analyst uses the ORCID iD to disambiguate publications as needed. Reduce author disambiguation issues : A librarian would like to locate all the research on a professor who has published under several names (e. g., John Sm ith, J. John Smith, J. Smith, Jorge J. Smith, etc .) and locates the author and ORCID iD in the IR@UF and then uses the ORCID iD to find additional research materials by this author Create unit publication lists, for reporting (and more): The De an of Research for the Institute of Food and Agricultural Sciences hopes to create a list of all faculty papers within his 28 departments for publication reporting. His Reporting C oordinator uses the list of ORCID i Ds to retrieve the list of publications. Impact assessment: A PhD candidate in the Classics department is working to develop his professional portfolio. He submits a poster presented at a recent conference to the IR@UF and creates an ORCID iD in the process. He later receives usage statistics reports from the IR@UF and uses th e se along with his ORCID iD profile page to show his research impact to prospective employers. Page 4 of 8 Use cases : ORCID creation for auth ors: A chemistry professor wants to contribute an open access article to the IR@UF and does not have an ORCID i D. The researcher understands the role of an identifier in demonstrating his research impact and logs into the IR@UF and the interface allows him /her to easily create an ORCID iD ORCID creation for co authors : An author submits a journal article to the IR@UF list ing four co authors. Based on the citation information, SobekCM with the ORCID API find s possible ORCID iD matches. IR@UF prompt s the a uthor to verify the coauthors based on the matches found through ORCID iDs. Associate publications dat a sets presentations, poster sessions, audio, video, and other scholarly and creative works : A n agricultural science researche r, when listed as a PI or lead author submits authored papers training videos, data sets, conference posters, reports, grant proposals, and other scholarly works to the IR@UF The researcher would like to locate all materials in the IR@UF where he/she was a collaborator and to display the collaborative and single author works together The researcher logs in and locates and connects a full list of materials with his/ her ORCID identifier. Support institutional data efforts : A Data Curation Coordinator for a campus research center wants to include ORCID identifiers in a locally managed profiling system and is already using the SobekCM API for UF authored publication data. The coordinator update s the query for the SobekCM API to include available ORCID iDs. Leverage ORCID identifiers for supporting external data sources and disambiguation : An Analyst in the Office of Institutional Planning and Research is developing a new reporting methodology to enhance faculty publication tracking and reportin g on all authored publications already in the IR@UF as well as publications held in other publisher database The Analyst uses the ORCID iD to disambiguate publications as needed. Reduce author disambiguation issues : A librarian would like to locate all the research on a professor who has published under several names (e.g., John Sm ith, J. John Smith, J. Smith, Jorge J. Smith, etc .) and locates the author and ORCID iD in the IR@UF and then uses the ORCID iD to find additional research materials by this author Create unit publication lists, for reporting (and more): The Dean of Research for the Institute of Food and Agricultural Sciences hopes to create a list of all faculty papers within his 28 departments for publication reporting. His/her Reporting C oordinator uses the list of ORCID i Ds to retrieve the list of publications. Impact assessment: A PhD candidate in the Classics department is working to develop his /her professional portfolio. The candidate su bmits a poster presented at a recent conference to the IR@UF and creates an ORCID iD in the process. Later, h e /she receives usage statistics reports from the IR@UF and uses th e se along with his ORCID iD profile page to show his research impact to prospect ive employers.